As I have mentioned in previous posts, I am 100% serious about holiday fun. :) And I will admit, I am drowning in my Christmas fun to-do list this year. I have quite a few movies on my Christmas movie bucket list, and have yet to watch any of them! A Christmas Story is okay, but I feel like I have seen it SO many times (probably 10 times per year, actually... The 24 hour marathon glues me to the TV - it is pretty gross, actually). I love Love Actually, but I never really know what is going on... The Santa Clause is okay, but just doesn't quite make the list for me... And I really am not into Polar Express (I tried to watch it last night and it is not very lighthearted... John and I got about 45 minutes in and went to bed! I just don't understand why everyone loves this movie). Any others I am missing?! To help keep track of these movies, I made a chalkboard with check boxes (I am huge on lists... It's the middle child in me). Loving the chalkboard!!! The only Christmas movie I have watched so far this year is The Holiday, but hopefully I can add to that list this week. Val! John and I just finished National Lampoon Christmas vacation last night.. soo good! I love your list but I LOVE your chalkboard even more. 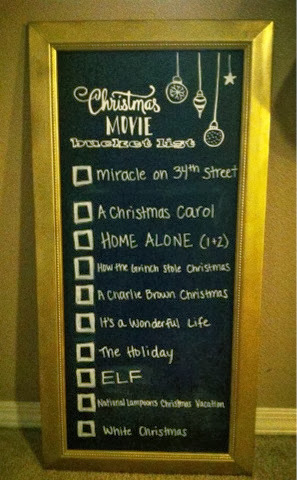 My family watches christmas movies year round LOL But that list is adorable written out like that! love the chalkboard checklist. I too love checklists they make me feel so productive. My favorites are Christmas Vacation, Elf, & It's a Wonderful Life, but I have been very into ABC's 25 days of Christmas and loving some of the ones of there. Holidaze is new this year--loved it! So happy you will only watch the animated Grinch!